Rick is a Regents’ Professor and UGA-Athletic Association Distinguished Research Chair in Biological Sciences at the University of Georgia, Athens, GA USA. He was the Founding Director of the Center for Tropical and Emerging Global Diseases at UGA, currently home to >25 labs working in the area of tropical parasitic diseases. Both his B.A. and Ph.D. degrees are from Wake Forest University, where he fell in love with Trypanosoma cruzi under the mentorship of Ray Kuhn. Since his undergraduate time, he has worked nearly exclusively in the area of Chagas disease, including studies of the mechanisms of immunity and disease in T. cruzi infection, and the development of diagnostics, therapeutics and vaccines for T. cruzi. Rick is the former chair of the U.S. NIH Immunity and Host Defense Study Section, and founder and convener of the Chagas Drug Discovery Consortium. Previous awards include the Burroughs Welcome Fund Scholar Award (1995) and the Lamar Dodd Outstanding Researcher Award, University of Georgia, 2012. 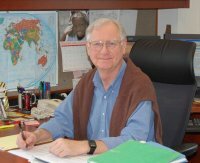 Dan has more than 40 years of experience in tropical disease research in schistosomiasis, Chagas disease, and tracoma. From 1993-2001 he was Director of the Division of Parasitic Diseases at the Center for Disease Control and served as the Director of the Center for Tropical and Emerging Global Diseases at the University of Georgia where he also directs the Bill and Melinda Gates funded global consortium for operational research in Schistosomiasis. Dan has been the recipient of numerous awards including Brazil’s highest scientific honor “Order of Scientific Merit, Class Gra-Cruz” presented by the President of Brazil in 2005. Steve is the Founder, Director, President & CEO of Savant HWP, Inc., a virtual biopharmaceutical company developing new medicines for particularly challenging diseases including drug addiction and neglected infectious diseases. He has more than thirty years’ experience in the biopharmaceutical industry and has contributed to the success of numerous complex and challenging healthcare projects. As the Chief Business Officer for The Immune Tolerance Institute (2007-2011), he helped establish a human immune monitoring institute for The Regents of the University of California that discovers and develops immune biomarkers. As a consultant to The World Bank and BIO Ventures for Global Health (2005-2009), he helped establish an innovative funding mechanism for pneumococcal vaccines for the developing world (PneumoAMC), including capacity for two billion vaccine doses and funding of more than $4 billion over the following decade. To date, approximately 100 million children in the developing world have been vaccinated against pneumococcal pneumonia under this program. As Founder, President & CEO of Sequential, Inc. (2002-2004), his team acquired and developed a clinical-stage oncology drug for the treatment of multi-drug resistance. While at Inhale Therapeutic Systems, Inc., (now Nektar Therapeutics, Inc.) (1994-2002), he held several senior executive positions, including Executive Vice President, General Counsel and Secretary, interim Senior Vice President of Operations, Vice President of Intellectual Property and Licensing and Head of Business Development and helped the company grow to over 700 employees, raise more than $700 million in investment capital and out-license multiple clinical development projects, generating revenues in excess of $100 million annually. Mr. Hurst is a graduate of Golden Gate University, School of Law and the University of California, Berkeley. Ric is a Professor at the University of Buenos Aires. His expertise is with the ecoepidemiology of Chagas disease with specific emphasis on infection transmission. Mr. Ricardo Preve is Argentinian by birth and is currently head of Ricardo Preve Films LLC (www.prevefilms.com), in Charlottesville, VA where he serves as a Producer and Director. Among his list of successful products is the documentary film “Chagas: A Hidden Affliction”. Michael is the founding CEO and President of Bantam Pharmaceutical a development stage cancer metabolism company. In addition, he is the Managing Partner of New Paradigm Biosciences, a spin-out of MIT focused on immune-oncology, and a board member of the cancer diagnostics company, PrecipioDx. Prior to his current roles, Michael was the Senior Vice President for Albany Molecular Research (AMRI), where he was responsible for the AMRI’s global discovery and development business including the launch of AMRI’s Buffalo translational discovery center. Michael was the founding President of the David H. Murdock Research Institute (DHMRI), a 501(c)3 Discovery-focused insititute. He joined DHMRI from Merck, Inc. where he was the Site Head and Vice President for the Merck-Frosst Centre for Therapeutic Research in Montreal. Before Merck, Michael was with GlaxoSmithKline for over 16 years in multiple positions of increasing responsibility including his last role as a Vice President in Discovery Research. His various roles included leading several successful discovery teams that led to launch of new therapeutics in oncology and metabolic disease as well as creating some of the pharmaceutical industry’s initial efforts in both precision medicine and drug repositioning. Michael holds Bachelor of Science degrees in Biology and Chemistry from North Carolina State University, a doctorate degree in Biochemistry from the St. Louis University School of Medicine, and an MBA from Duke University. He was a Muscular Dystrophy fellow at The Salk Institute. He is the author of over 57 scientific publications, and holds issued patents in diagnostics and pharmaceutical discovery and development. Eric Easom, President & CEO, AN2 Therapeutics, Inc.
Mr. Easom has over 27 years of leadership experience in the biotechnology and pharmaceutical industry and has spent the last 15 years focused on bringing innovation to address significant unmet needs in infectious diseases focused on the developing world. Currently Mr. Easom is the Founder, President and CEO of AN2 Therapeutics, an R&D stage biotech focused on anti-infectives. Previously, Mr. Easom spent 9 years at the highly successful Anacor Pharmaceuticals which was acquired by Pfizer for $5.2B in 2016. During his tenure, he led Anacor’s R&D on neglected disease programs that achieved global prominence, working in close partnership with funding agencies (the Bill and Melinda Gates Foundation, the Wellcome Trust) and public and private partners (including The University of Georgia (Tarleton Lab), Medicines for Malaria Venture, Global Alliance for Veterinary Medicine, Drugs for Neglected Disease initiative, GlaxoSmithKline (GSK), Eli Lilly & Company, etc) to discover over a dozen potentially transformational medicines for diseases such as malaria, tuberculosis, river blindness, cryptosporidiosis and trypanosome diseases including Chagas disease, African sleeping sickness and leishmaniasis. Eric also served on the Board of Directors for a Seattle-based nonprofit, the Infectious Disease Research Institute, from 2007-2014, serving as Chairman from 2009-2013. He has served as a guest lecturer at the University of Washington, Seattle University and San Jose State University. The majority of his early career was at Eli Lilly and Company, followed by stints at McKesson and biotechs MedImmune and InteKrin Therapeutics.